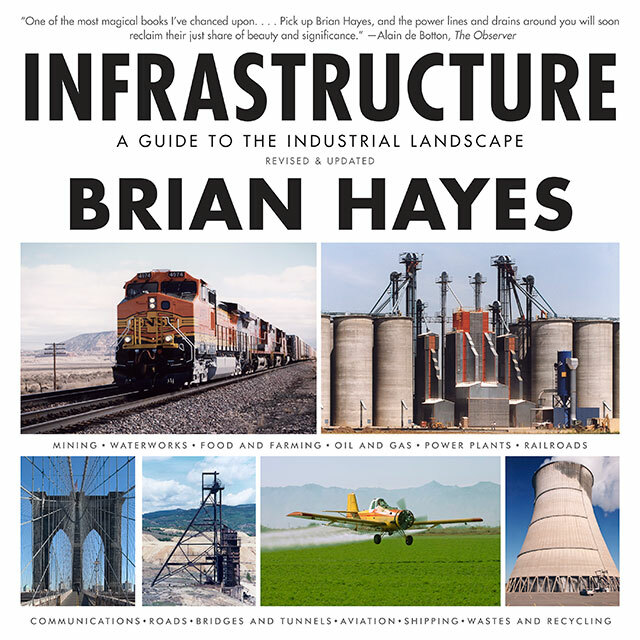 The new edition of my big picturebook, Infrastructure: A Guide to the Industrial Landscape, was published October 27th and is now on display in better bookstores everywhere. Above is the cover; below is the book as seen in the wild—on the shelves of the Harvard Coop and the MIT Press Bookstore. And, yes, you can also get it at Amazon. So what’s revised and updated in the revised and updated edition? It’s been almost a decade since the first edition came out, which is ages in Internet years. And, as a matter of fact, the chapter on communication technology was the one most in need of updating. No one seems much interested in fax machines and beepers these days; brushing those topics aside made room for a new section on data centers. The petroleum industry has also changed dramatically: Fracking is no longer a novelty, and worries about “peak oil” seem to have been displaced by “the new Saudi America.” Meanwhile aviation is on the cusp of a great change, as the whole network of ground-based navigational beacons is about to be dismantled in favor of GPS. On the other hand, I couldn’t find much of anything new to say about American railroads. They still represent the pinnacle of development of 19th century technology. It’s not only the landscape that has changed; I have changed too, and I would now offer a somewhat more cautious assessment of how technology serves human needs. Not that I’m about to join the Luddites; I still believe that if we’re going to accommodate 10 billion people on this planet, we need all the technological help we can muster. But I’m not greatly impressed with our social and economic mechanisms for choosing which technologies to pursue. The new edition gave me a welcome opportunity to correct some errors, to add a few new photos and to improve the presentation of all the photos. (There are more than 750.) And I’m pleased to report that the publisher (W. W. Norton) and the printer (a branch of R R Donnelley in China) have done quite a spiffy job of bookmaking. They’ve also held the price at $35, the same as the older paperback. If you read the first edition, should you run right out to buy a copy of this new one? I won’t try to talk you out of it. Admittedly, this is not a new book; it’s an improved version of the old one. But I’d like to think it’s worth reading again, and you might as well have the benefit of the latest word. I’m a big fan of your writing. I read all your American Scientist columns and I have the older edition of “Infrastructure.” I’ve given copies as gifts too. You post infrequently, so I only load your site every week or so to see if there’s anything new. I’m sure it’s hard to come up with high-quality original material on a regular basis, but if you’re interested in more traffic, you might consider posting a weekly list of links to interesting articles you’ve run across and books you’ve read. A blogroll would also be interesting. Thanks for your note and your kind words about my work. When it comes to the book web site, however, I have no excuse. As I said above, I’m unhappy with its current state, and I need to fix it. That may take me a week or two.